We are in the middle of a enormous change of the culture of teaching and learning. The teacher must see himself/herself as a learner, since he/she is on uncharted territory as well in our ever changing (digital) world. Key competencies and literacies, such as global, media, network, information literacy and digital citizenship amplify our traditional notion and expectation of basic literacy in education. In addition to the traditional content knowledge we are expected to teach/learn in schools, we must include learning how to learn. How do we achieve this in a culture of “drive by”workshops, once a year conferences, fly in/fly out consultants? The new literacies and new media require of each one of us the capacity to stay constantly up to date. Teachers must learn for themselves what this means for their own professional growth in order to transfer these experiences and emerging pedagogies into their classrooms. I am working with a cohort of teachers from the Goethe Schule in Buenos Aires, Argentina in a Blended Coaching Model. Our work consists of onsite consulting, job embedded instructional coaching and workshops, blended with online coaching, workshops and feedback in the areas of modern learning skills and literacies. 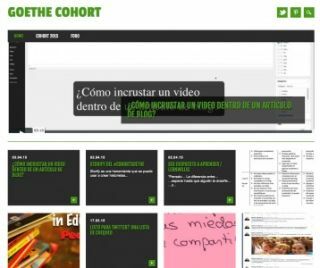 I spent five days in an intensive bootcamp with the participants in Buenos Aires, laying the foundation of the paradigm shift in education, establishing a common vocabulary and background information as well as equip participants with the technology know-how-skills to continue our coaching and learning relationship virtually for the rest of the school year (March-December 2015). pedagogical documenting as learning on a variety of levels and for reflection through a variety of techniques including visible thinking. the school develops a public digital portfolio of their professional development initiatives, as well a show-and-tell of best practices and pedagogies. The portfolio serves as a parent-school communication as well as a resource for other schools. Pedagogy is defined as the methods, techniques and strategies of teachers to facilitate learning. As teachers we are charged to prepare our students for THEIR future as active members of society and for the challenges the 21st century and beyond bring with them. The central hub of our work together can be found on the Goethe Cohort Blog. Cohort participants document their general learning as well a more specific area of interest to them on their GloballyConnectedLearning blog. As the first month (March) of school in the Southern Hemisphere came to an end, I am in turn documenting the incredible variety of documentation style, reflection and learning growth that is occurring via the blogs of the cohort participants. Did I mention that SHARING is a huge component of the work? use of different media (text & image) to document her learning journey.